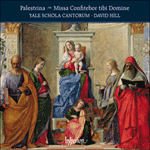 Palestrina’s motets were published in separate partbooks, one for each voice part. This did not mean that they were only performed like that, with one or more unaccompanied singers on each part: in the liturgy they could be accompanied, or substituted, by organ and by instruments like the cornett and sackbutt. Motets also had a use outside of the liturgy, sung for entertainment which might be devotional or not. Motets could also be played on the organ without singers or instrumentalists, in which case they became studies in counterpoint, each successive phrase exploiting a musical motif which, though originally conceived to match a phrase of text, could also function on its own. This was the basis for the Italian instrumental ricercar made up of a series of imitative workings of themes, called points of imitation. Eight such ricercari are attributed to Palestrina in a late-sixteenth-century Roman manuscript, one in each of the church modes. They appear with a large number of scored-up motets by him and a host of his contemporaries; the manuscript is thought to have been compiled by a Roman organist for his own use. Ricercari could be played during Mass, particularly during the Offertory, or in other liturgical contexts. Their attribution to Palestrina cannot be verified but he did play the organ and, if he had composed such pieces, they would certainly have been in this style. The Ricercar del quinto tuono is played by cornett and organ here, the cornett taking the top voice with the other three being played on the organ.